Scenes of daily life and domestic interiors were very common in seventeenth-century Holland, and pictures of the new burgher classes busily going about their daily chores or engaged in leisure pursuits were particularly popular. This painting is enormously important in terms not only of its artistic merit, but also its historical value, since it faithfully reproduces the original decoration of the Council Chamber in Amsterdam’s Town Hall. The lighting is typical of de Hooch: the skilled use of various light sources creates a play of shadows enhanced by a warm colour range. The composition is characteristic of architectural paintings, in which a very wide angle of vision converges on the centre of the chamber. Like his contemporary Vermeer, Pieter de Hooch depicted scenes of everyday life set in tranquil interiors. His models were middle-class wives and young women engaged in their daily activities or captured in moments of leisure. These scenes, which allow us entry into the private spaces of Dutch homes in the second half of the 17th century, show life as it takes place with all its small details. The history of the present canvas is known from the early 20th century when it belonged to Peter Ernst, Baron of Stackelberg, passing by inheritance to his son Egbert, in whose collection it was to be found in 1918. It was later with various galleries: Van Diemen in The Hague in 1925, H. Rheinhardt in New York in 1927, J. Böhler & Steinmeyer in Munich and New York in 1929, and again in 1931 with Rheinhardt. It was then in the collection of W. J. R. Dreesman in Amsterdam and with two further galleries before it was acquired for the Thyssen-Bornemisza collection in 1960 from the Cramer gallery in The Hague. Interior of the Council Chamber of Amsterdam Town Hall was painted in the 1660s after De Hooch had moved to that city. It departs from his normal subject matter, which had reached its maximum level of quality during his Delft period. In addition to being a historical document of the highest importance as it reproduces the original decoration of this famous room in the recently built Town Hall of Amsterdam, the canvas also offers a vision of citizens during their leisure time, visiting the city’s most important building. For his depiction of the room, De Hooch applied the principles of another genre of Dutch painting, that of architectural views, whose rules he could have learned from Carel Fabritius. He used an exaggeratedly broad viewpoint whose vanishing point lies in the centre of the painting in the spot where the couple seen from behind look at the painting on the end wall. 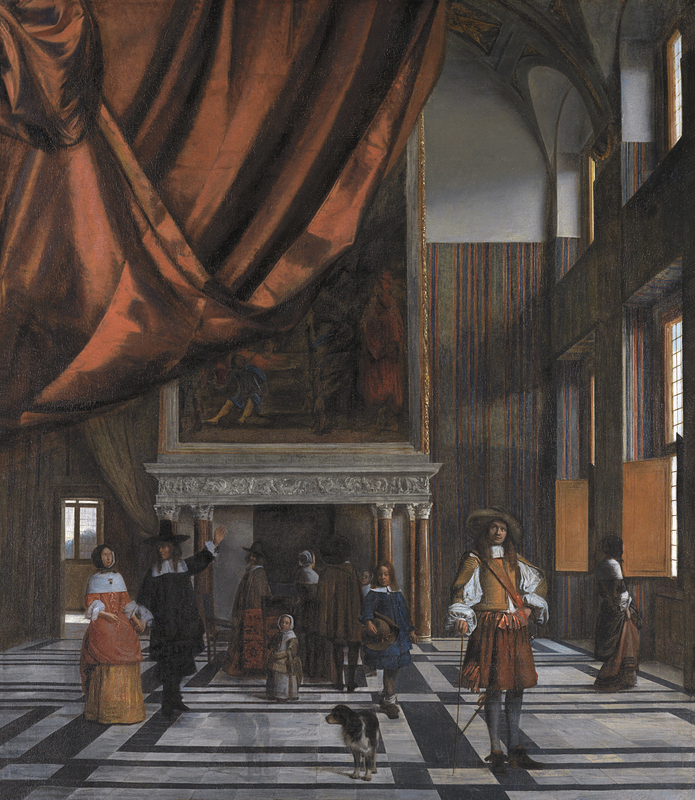 As in architectural paintings, De Hooch added the figures later, and it is possible to see various pentimenti (such as the dog, which was originally further to the left). The room, illuminated by natural light entering from the large window on our right, leads on to another space through an open door on the left that gives onto the exterior. This connection between rooms with different sources of light is typical of De Hooch and was perfected in his work between 1655 and 1662. The light, entering through the plain glass windows, created an accentuated play of shadows in the room. The chromatic range focuses on warm tones, as in the theatrical red curtain suspended from the ceiling on the left and the colours of the figures’ clothes, contrasting with the greys and ochres of the architectural fittings and details. Amsterdam Town Hall was designed by Jacob van Campen. Construction began in 1648 and the room depicted here was in use by 1655. It was adorned with two huge canvases: one by Ferdinand Bol, seen here on the end wall, entitled Gaius Lucinus Fabritius in the Camp of King Pyrrhus, and another, located at the opposite end of the room and thus not visible to the viewer but the object of interest of the figure in the foreground, painted by Govert Flinck and entitled Marcus Curius Dentatus Refusing the Gifts of the Samnite Ambassadors. Both works were intended to remind city officials of the virtues of incorruptibility and valour in the exercise of their duties. In addition to these two famous works, the cornice of the fireplace was decorated with verses by Jost van den Vondel and with a relief by the studio of Artus Quellinus, one of the city’s best sculptors. The relief includes putti and marine creatures, with the city’s coat-of-arms in the centre. De Hooch also depicted the Town Hall of Amsterdam in other works, such as the canvas now in the Museum der Bildenden Künst in Leipzig entitled A Concert in the Entrance Hall, and the one in the Musée des Beaux-Arts, Strasbourg, entitled Couple Walking in the Vestibule of Amsterdam Town Hall. 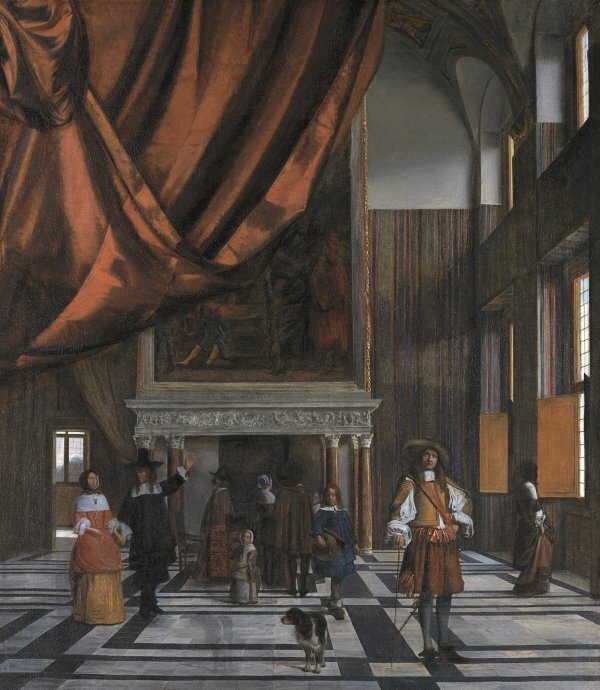 The Town Hall also inspired an interior view by Gabriel Metsu in the Metropolitan Museum of Art, New York, whose background repeats the present view with the large fireplace. Peter Sutton dated the present canvas to around 1663–65.